Crystal Exchange America has a client with a few extra Swarovski Country Mos to sell quickly. So to assist in the clients wishes, Crystal Exchange is running a promotion with a coupon valid specifically on the Swarovski Country Mo Lovlots cows. The Country Mos is a pair of Swarovski Limited Edition Cows in the Swarovski Lovlots product line that was available online only in 2010. The Swarovski Country Mos are clear with brown or black spots and horns matching the spots. The bells on the cows are a golden color. The original retail price of the Swarovski cows was $105 + shipping. The following coupon code ‘kbuzzcow3′ can be used during checkout to save $25 on the already attractive prices of the Swarovski Country Mos. The coupon is good for the purchase on Swarovski Country Mos only and does expire April 30, 2011. 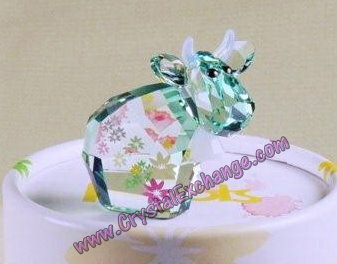 Purchase several pair and create your very own Swarovski Country Mo Cow herd! Swarovski designed and sold its first cow in the Swarovski Lovlots series, Missy Mo, in 2006. Missy Mo is clear in color and is still a member of the current product offerings. After 2006, Swarovski began issuing this same design, changing the color, and offering the colored cows as limited edition figurines. In 2007, Swarovski made the first Limited Edition Mo, the Swarovski Pinky Mo. Pinky Mo is, just as its name suggests, pink in color, with white horns and bell. In 2008 Swarovski produced its next Limited Edition, Swarovski Soccer Mo. Soccer Mo was red in color, with white horns and bell. In 2009, Swarovski collectors were blessed with two Limited Edition Mos….Flower Mo and Halloween Mo. Swarovski Flower Mo was light green in color, decorated with small rose, yellow, and white flowers, with white horns and bell. Swarovski Halloween Mo was orange, with black horns and bell. In 2010, Swarovski produced the Limited Edition cows as ‘couples': Swarovski Country Mos and Swarovski Glamour Mos. The Country Mos were clear with brown or black spots and horns matching the spots. The bells were a golden color. The Swarovski Glamour Mos were the first cows to NOT have bells. Instead, the female cow (golden in color) had a pearl necklace and the male cow (black in color) sported a small bow tie. 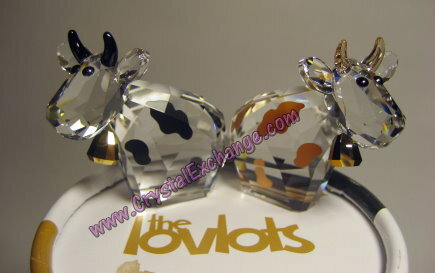 The individual Swarovski Lovlots cows generally sold for $55 – $75 from the Swarovski web site while the cow pairs retailed for $105 – $120. 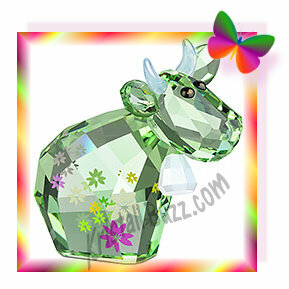 However, the best performing Limited Edition cow is certainly the Swarovski Flower Mo. Flower Mo is unquestionably cute….perhaps that is why it presently sells for the highest prices in the online auctions and at the retired Swarovski dealers. 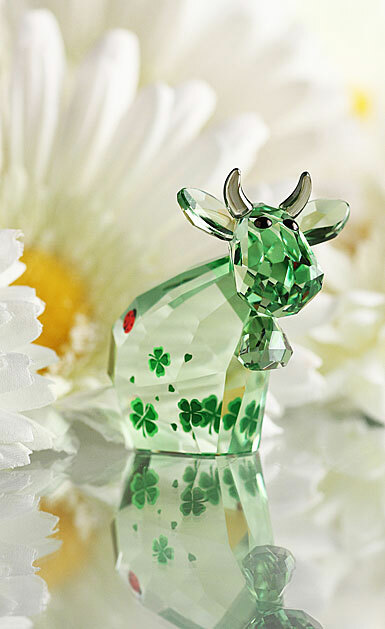 The present selling prices are incredible for this Swarovski green cow… in the range of $275 – $325, which is up (on average) $75 from prices in December, 2010. The upward spiral in price is unbelievable…is this some indication it may reach $400 by the end of the year? With more Limited Edition Mo figurines on the horizon for 2011, it will be interesting to see if the Flower Mo prices will continue to rise, or if a 2011 release takes command once it is sold out. 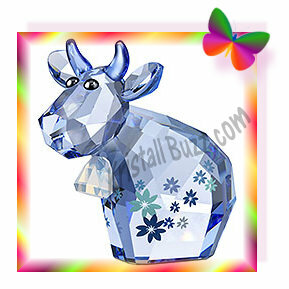 Crystal Exchange America has all the Swarovski Limited Edition Cows and other special edition Swarovski Lovlots crystal figurines on their web site. If the dramatic rise in price is a trend (not just temporary), purchasing sooner rather than later, may be a good idea.